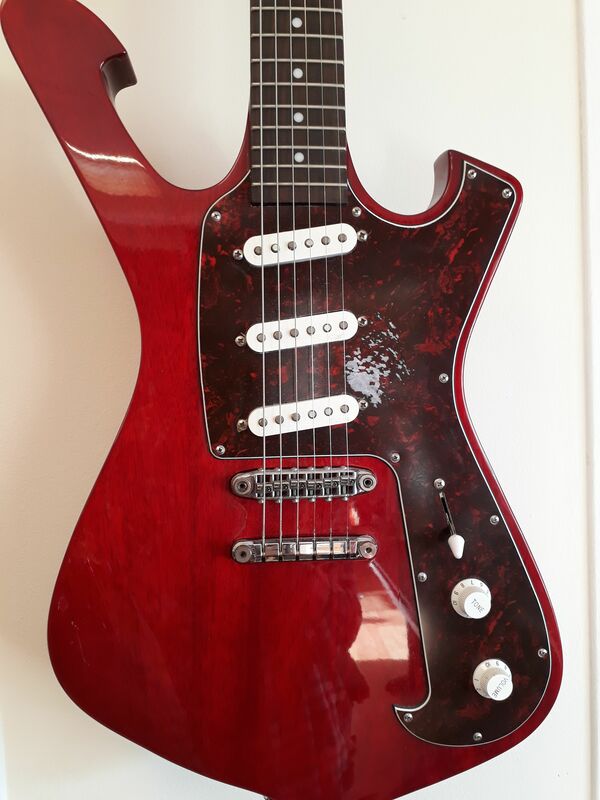 FRM100, Other Shape Guitar from Ibanez in the Paul Gilbert series. Simon60's review (This content has been automatically translated from French)" A beast! 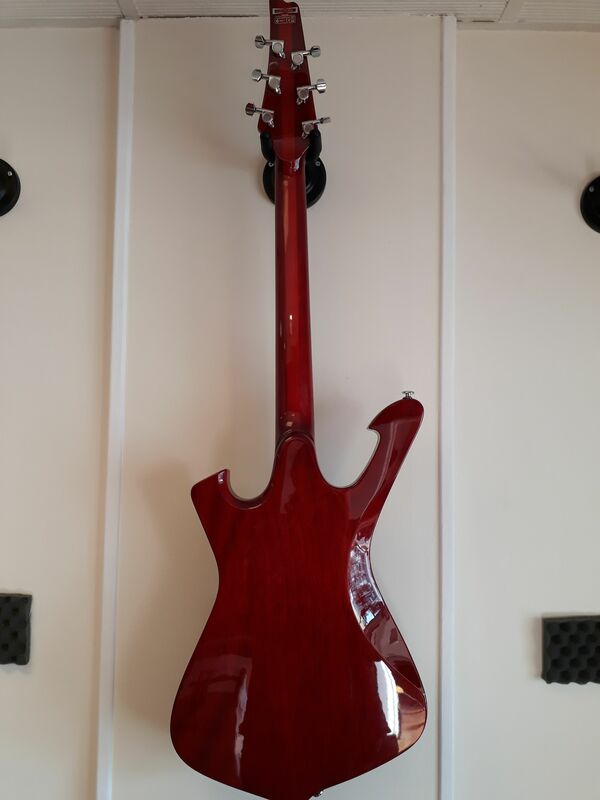 ..."
To start, the sleeves used Ibanez and Fender in general, I was afraid when I grip, falling on a handle which approximates closely to that of a les paul! And wide enough so épaix, a big "C" and pasted. 22 frets, Dimarzio injector in neck and bridge, and Dimarzio Area 67 'in the middle, selec 5, tone and volume ... it is simple. The pickups are oddly placed? ... Yes in fact it was the idea of ​​PG. Fan of Hendrix, who played on a stratovolcanoes so right-handed but left-handed ... We thus find the inclination of the reversed bridge pickup as the master (but on each microphone so), and the pads of a reversed U-turn on themselves. So this big stick ... Ben super nice! Factory setting perfect, being luthier, I'm used to review any new scratches as always disappointed ... And then we just break your fingers on it, it sounds right now, it plays itself! The shape ... large first glance, everything is great ... (Like the old fellow, PG) but in the end, it does not shock at all, and it is standing or sitting very alaise. The pickups send terrible! Sound crazy, the injectors must correspond to texas special multiplied by 3! A biting mad! But when I went home with, I played for 3 hours with sitting on my couch without realizing it before connecting! So it sounds! Sustain, power, harmonics, all here! I've had guitars from leading brands on the market, but one has never sounded like this. 10/46 home, me going up all my guitars (twenty) into 9/42, I was nervous, and ultimately, having a pitch shorter, 10/46 does not feel! I play everything, but mostly from Mr. Gilbert, then ... it fits perfectly! Ultra versatile! Adding this tone compared to other PG model makes sense, because the microphones and distortion at high volume (say a 100 watt lamp head thrust to 80%) tend to be quite out of acute compared to double, then you can control. So I use it for 3 months, intensively! Although I do not play safe on it, let's say I titillates 10 hours per week and during concerts. If I had to keep a guitar from my various other guitars which include all models that we can know, it'll be this one, a perfect compromise between Srato and Les-paul ... yes it is! it exists! What I love most, power and sustain its load, taking an unprecedented scale when plugged! What I like least, a small detail, this new type of Ibanez tailpiece "tune o matic" includes an easel a bit aggressive for mid acute, me playing "as the master" with a lot of bend and with a big attack, the life of the cord did not exceed 4 hours at first, but after the 10 th change, it does not move. The quality / price ratio is amazing, not the beast beast, she comes in to save on the cover price back, cover fair. For me, the best finishes and best of all models of the brand signatures. Finally, I bought this guitar as my finances do not allow me too, well, I was not disappointed! I will ever be the same thing right now! 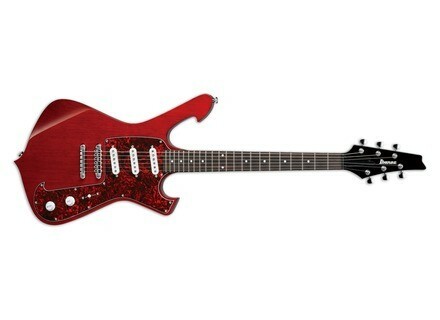 Ibanez has announced the new FRM100TR, inspired by Paul Gilbert with the original Ibanez Fireman model.